Drea's Dream has become a reality! 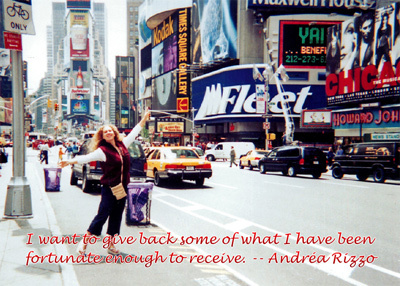 The Andrea Rizzo Foundation holds a special place in my family's heart. The foundation was established in memory of Andréa Rizzo, one of my cousin's dear friends, who I had the pleasure of meeting on a few occasions. This beautiful young woman, who beat childhood cancer and became a dancer and Special Education teacher, had her life tragically cut short by a drunk driver at the age of 24. 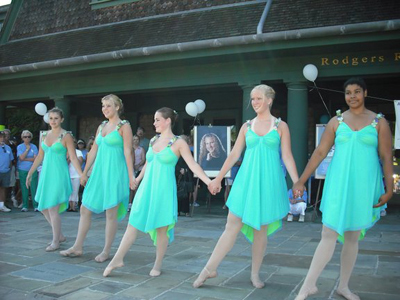 Dréa’s dream was to share her love of dance with, and positively impact the lives of fragile children. She was attending graduate school at NYU and pursuing her goal of becoming a dance therapist when her life was cut short after attending a dance performance in 2002. Thanks to her vision, and the determination and hard work of her family and friends, Dréa’s dream is being fulfilled and the lives of children are being touched every day. So how can you learn more and help the cause? The best thing for you to do is to visit DreasDream.org to learn more about Dréa and the great work her foundation is doing. Another way you can be a part of making Dréa’s dream come true is by volunteering and participating in some of the foundation's programs and events. The Andrea Rizzo Foundation sponsors many programs across the nation that make a difference in children's lives, such as Pediatric Medical Centers in California, Connecticut, Florida, Massachusetts, New York and Rhode Island. 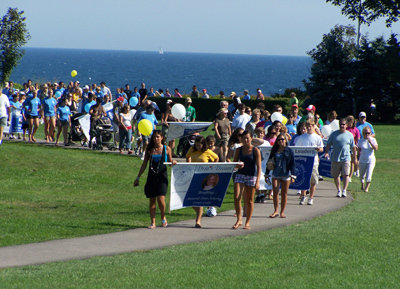 The next event coming up is the 9th Annual Walk for the Children, which will be held in Newport along its beautiful and historic Cliff Walk. The walk is on Sunday, August 15, 2010 at 2:30 pm. This walk benefits children with cancer and special needs at the Hasbro Children's Hospital and local public schools. It begins and ends on the campus of Salve Regina University, at the Rodgers Recreation Center. Annual Andréa Rizzo Foundation Golf Classic - This event is held at The Woodmere Club, in Woodmere, NY on October 25, 2010. Time to be determined. Heart and Feet Dance Exhibition - Thursday, June 3, 2010 from 8:00 pm – 10:30 pm at the Housing Works Bookstore Café - 126 Crosby Street, New York City. Dance Across America 2010 - United States Dance schools and dance companies across the U.S. participate. Benefit Performances can be offered all year long! Like any other charitable foundation, donations are greatly appreciated. There are many programs sponsored, events held and lives touched by your generosity.